International Union of Engineers Local 115 Donates to the BCPFF Burn Fund! 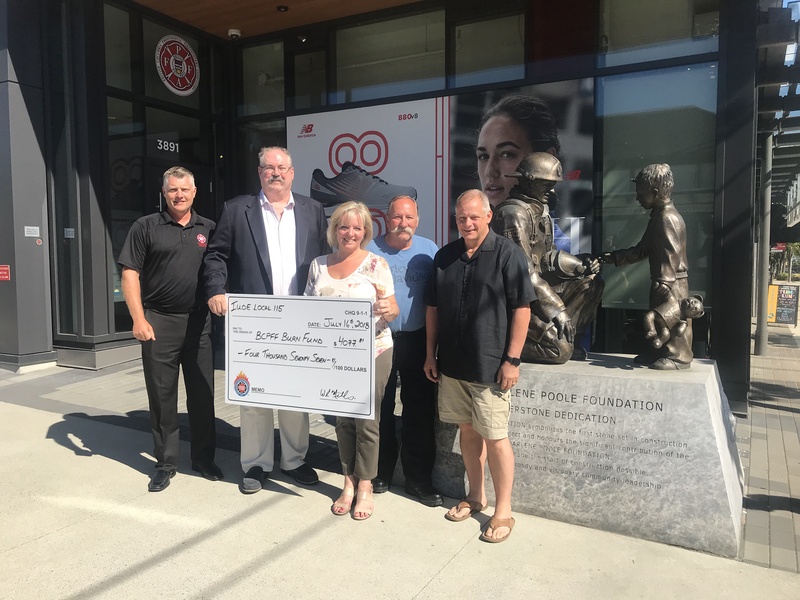 Vancouver – The BC Professional Fire Fighters’ Burn Fund are very excited to receive a generous donation of $4,077.81 from the International Union of Engineers (IUOE) Local 115 and their members! We are very grateful that the IUOE has contributed these essential funds that are vital to the BCPFF Burn Fund’s ongoing programs and support offered to the citizens of BC. Our fundraising efforts, program delivery and growth of the Burn Fund could not happen without the continued generousity and support of organizations such as the the IUOE. The cheque was presented to the Burn Fund by Wayne Mills, President of IUOE Local 115 on Monday, July 16th at the Burn Fund Centre. The Burn Fund supports lifesaving medical care, assists survivors and prevents future tragedy thanks to generous donations from the community. Please help with a gift today.